Pattern Info: 5mm square holes spaced 3mm apart. Interwoven square effect decorative aluminium grille anodised to produce a satin silver finish. Ideal for use in radiator cabinets / covers as grilles, door panel inserts, furniture manufacture, custom ventilation grilles and general interior design and home improvement screening uses. Interwoven square effect decorative grille in anodised aluminium satin gold finish. 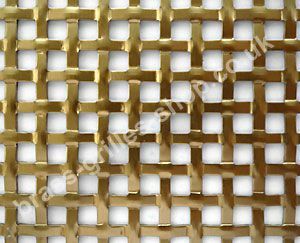 Woven square effect aluminium decorative grille in attractive anodised bronze colour finish. Interwoven square effect aluminium decorative grille in white powder coated finish. Maze decorative metal grille sheet. Powder coated in hard wearing satin white finish. Maidstone gold anodised aluminium decorative grille.